Running for more than 300 kilometers, the Danube Bike Path is a scenic path that follows the Danube River from Passau, Germany to Vienna, Austria. The road is both smoothly paved and wide, making it popular with cyclists of all ages and skill levels. In fact, it has been called the most popular place for leisure cycling in Europe. In total the bike path passes through nine countries. With the Danube River flowing on one side and the scenery changing around you on the other, the landscape varies throughout the journey. Mountains, forests, castles, vineyards, and small European villages are common sights. 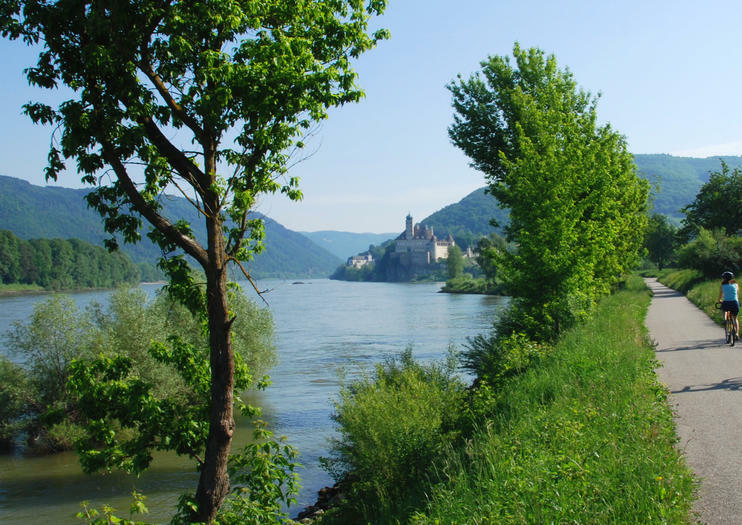 This route passes through the historic Wachau Valley as well as the Austrian town of Linz. Most of the land is sparsely populated and the roads are calm and traffic-free, making this a relaxing way to enjoy the beautiful nature of this region. The Danube Bike Path is well marked by signs throughout. It begins in the German town of Passau, close to the Austrian border. It continues through Austria to Vienna, a distance of about 230 miles. Most do the trip in six to seven days, averaging around 40 miles per day. This tour is not available at the moment, we will let you know soon of the new availability!Explore the road less traveled on this 3-hour bike tour through the Vienna Woods. Led by an expert guide, hop on an electric mountain bike and begin your adventure through Vienna’s forestland. Soak up incredible views of the city before stopping to relax at a wine tavern. Your tour is limited to 10 people to keep the experience as intimate as possible.